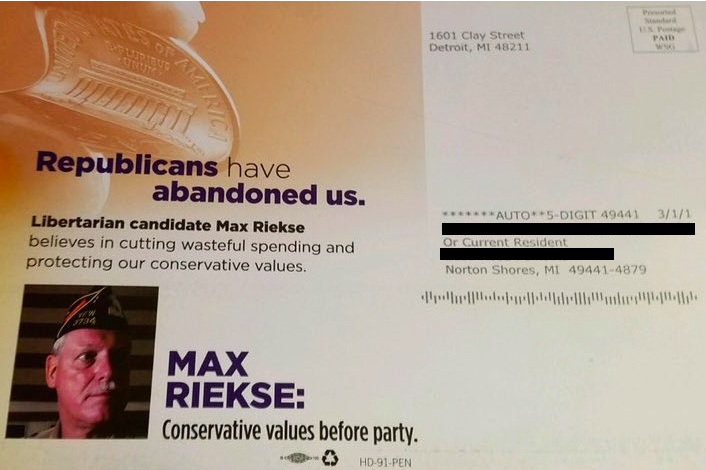 LANSING — In two of Michigan’s most competitive state House races, mystery mailers have emerged touting the conservative credentials of Libertarian candidates. The mystery comes in the fact that the Libertarian candidates mentioned in the mailers have no idea who sent the pieces out. Republicans believe that Democrats are the ones responsible for the anonymous mailers. In a year where third-party candidates are doing better than normal at the top of the ticket, Republican-leaning voters choosing Libertarian candidates in close House races could swing the races to the Democratic candidates. But a spokesperson for the House Democrats says she knows nothing about such a strategy. “If you find out who it is, I’ll write them a thank-you note,” Riekse added. Someone paid to distribute at least two mail pieces in support of Riekse, of Fruitport, in the 91st District. 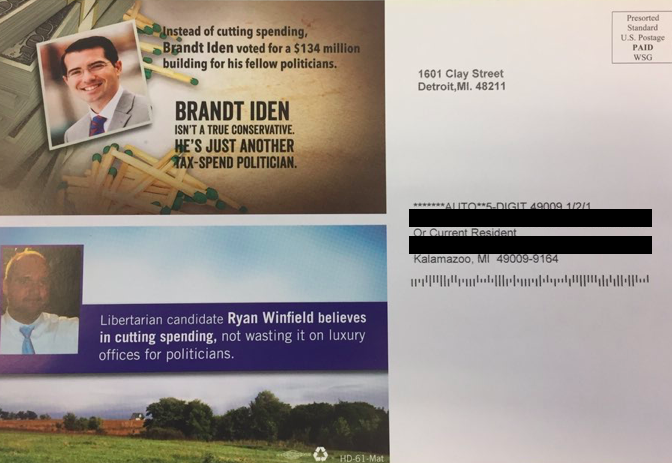 Someone also paid to distribute two mail pieces in support of Libertarian Ryan Winfield, of Kalamazoo, in the 61st District. Winfield wasn’t even aware the mailers had gone out when called on Friday. The mailers don’t include a disclaimer as to who’s responsible for their distribution. Such disclaimers are required for political mass mailings in Michigan. The mailers do include a return address of 1601 Clay Street, Detroit, which is home to a mailing and communications business. Democrats and Republicans have been spending big in both the 61st and 91st districts for their own candidates. The 91st District race between Rep. Holly Hughes (R-Montague) and former Rep. Collene Lamonte (D-Montague) has seen the most broadcast TV advertising of any state House race so far this fall. The 61st District race between Rep. Brandt Iden (R-Oshtemo Twp.) and Democrat John Fisher, of Portage, has seen more than $100,000 in advertising and a barrage of mail pieces. Winfield himself said he’s received about one mail piece a day from the Iden and Fisher campaigns. “It’s pretty amazing how much money they’re blowing on that stuff,” Winfield said. The same mail piece — featuring fingers pinching a penny — went out in support in Riekse. A picture on the mailer shows Riekse in a Veterans of Foreign Wars hat, a hat that he says he doesn’t wear while campaigning. The other mailer that’s gone out in the two districts criticizes the Republican candidates in the races for “voting for a $134 million” new office building for state senators. “Libertarian candidate Ryan Winfield believes in cutting spending, not wasting it on luxury offices for politicians,” the 61st District mailer says. Democrats have frequently used the Senate office building as an attack line against Republican candidates this fall. The fact that that specific attack is also used in the mailers touting Libertarian candidates is one of the reasons Republicans believe that the mailers could be coming from Democratic forces. Asked about the mailers, Katie Carey, spokesperson for the House Democrats, said she hadn’t seen or heard about such a strategy. "We are focused on talking to voters about our candidates and their plan to prioritize Michigan families," Carey said. "I have no control over what other groups send out on other candidates." 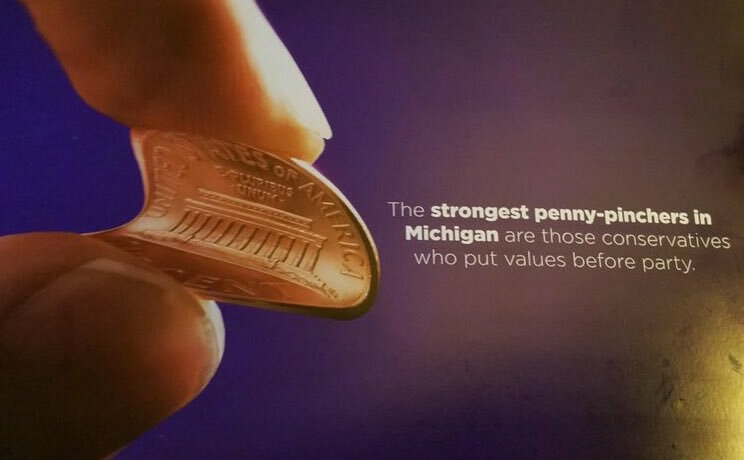 Because the mailers don’t directly tell voters whom to support or reject on Election Day, the donors behind them don’t have to be disclosed under Michigan’s loose campaign finance regulations. However, if more than 500 copies of the mailers were distributed in the districts, they should include disclaimers with the name of the group responsible for sending them out. Riekse said the mailers touting his campaign appeared to be distributed across the 91st District. Riekse also said he asked Lamonte, the Democratic candidate, whether she knew anything about the mailers. “She doesn’t know anything about it,” Riekse said. The unaccountable pro-Libertarian mailers are another example of stealth spending in this year's state election campaigns. Similarly, two stealth administrative accounts that don’t disclose their donors have sponsored robocalls against Democratic state House candidates in at least six state House districts.